Some have observed that the 3rd Congressional District primary is getting “personal.” One way it’s getting personal: The candidates are sinking personal funds into the race. Developer Don Wiviott, according to a report filed Tuesday, just sunk another quarter-million dollars into his campaign. This brings Wiviott’s total of self-contributions to $1.34 million for his House campaign plus another quarter-million and change of his own money he spent on his aborted U.S. Senate campaign last year. 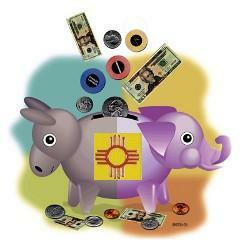 Meanwhile, Ben Ray Luján this week reported taking out a bank loan of $150,000 for his campaign. That’s on top of a $50,000 loan he took out earlier in the race. Sneak preview: The next round of campaign finance reports for congressional and Senate candidates isn’t due until today. But the June 3 primary is so close that federal law requires reports of contributions of $1,000 or more within 48 hours of the contribution, so a few of those are popping up. Luján reports getting $2,300 from Ohkay Owingeh; $2,300 from Margaret Moñoz of Gallup; and $1,000 from Yvette Dobie of Laguna Beach, Calif.
Wiviott reports $2,050 from Edmund Schenecker of San Antonio, Texas; $1,500 from Michael Wilson of Albuquerque; and $1,000 each from Jonathan Potts Wendell of Greenwich, Conn., and David Gold of Albuquerque. Also, CD 3 contender Jon Adams filed his report a day early. He said he’s raised a total of $51,500 for his campaign so far, which includes $13,000 in loans. The two Republican Senate candidates already reported their totals. U.S. Rep. Steve Pearce says he has raised $357,000 since the beginning of April. He spent $964,784 and has $247,207 in the bank. His rival, U.S. Rep. Heather Wilson, reports raising $291,106 for the same period. While that’s $66,000 less than Pearce, Wilson reports having $712,476 in the bank. Brace yourself, Bridget. That’s going to pay for a lot of television ads in the last week and a half of the primary campaign. Rescinding a non-endorsement? Earlier this month on an interview on KNME’s In Focus, U.S. Sen. Pete Domenici said he wasn’t going to make an endorsement in the Republican Senate primary. Earlier this week, however, Domenici called upon candidate Pearce to demand The Club For Growth withdraw its new ad blasting Wilson for voting in the House for the State Child Insurance Program, or S-CHIP. Domenici voted in favor of the bill in the Senate. Pearce voted against it in the House. President Bush vetoed it. The offending ad actually stopped running before Domenici called for it to be pulled. But that’s beside the point. Could Domenici be thinking this ad is “untoward”? Is there still some Richardson campaign we don’t know about? It seems our governor sure has been out of state a lot lately. On Tuesday, CNN reported, “Bill Richardson will campaign this week for Barack Obama in Puerto Rico, 10 days before the Commonwealth holds its Democratic primary, a Richardson aide tells CNN.” Apparently Richardson is visiting the island today. Puerto Rico can’t vote in the general election. But in the Byzantine glass bead game of the Democratic nominating process, the island has 55 pledged delegates at stake in the primary. Earlier this week, the governor was on the East Coast. He gave a commencement speech Sunday at the University of Pennsylvania Law School in Philadelphia, shortly after receiving a Titan of Technology award and delivering a keynote address for the Eastern Technology Council at Drexel University. That same day, he spoke to the World Council of Philadelphia and the William Hughes Center for Public Policy in Atlantic City.